Boy Erased has all of the ingredients of a Best Picture Oscar winner, including three of the most devastating performances to this year grace the screen. What it ultimately lacks, holding it back from reaching masterpiece territory, is the right filmmaker to get it across the finish line. This isn’t to completely lambaste the picture’s writer-director-actor-producer Joel Edgerton, who in the past has proven himself a marvelous talent both in front of (in It Comes at Night and Loving, among others) and behind (with The Gift) the camera. Edgerton here delivers a very fine film, albeit a frustratingly workmanlike effort that leans heavily on its actors and source material. It’s an endeavor that finds Edgerton an immense talent at getting the best out of his actors, while sporting very little visual flair himself as a filmmaker. The film, based on Garrard Conley’s eponymous 2016 memoir, follows Jared Eamons (Lucas Hedges, yet again proving himself one of today’s finest young actors), the son of Baptist parents (Russell Crowe and Nicole Kidman), who, upon revealing his homosexuality to them, reluctantly agrees to enroll in a gay conversion therapy camp. There, Jared befriends other participants, each struggling to navigate and survive their way through this hellish experience. The program is spearheaded by “therapist” Victor Sykes (Edgerton), whose conversion methods are equal parts manipulative, traumatizing and sadistic. Boy Erased is at its most compelling when focused on the family dynamic, with Hedges, Crowe and Kidman having an absorbing, all too convincing rapport that often rings of Ordinary People. Each actor is turning in some of their very best work, perhaps Crowe in particular, who absolutely kills it in his final scene toward the picture’s end. There’s also a terrific cameo from the always fabulous Cherry Jones, portraying the family physician, none too sold on Jared entering the program. Less stirring are the camp scenes, with Edgerton too muted as the ringleader to pack the necessary punch. There are, however, very affecting scenes around the lead-up to Jared’s coming-out, including a shattering sequence involving classmate Henry (Joe Alwyn). Constantly jumping back and forth between past and present, and compellingly so, Edgerton’s screenplay is a greater success than his direction, which veers from the uninspired to the heavy-handed. Review: "Can You Ever Forgive Me?" In 1967, the year of Spencer Tracy’s death, up-and-coming writer Lee Israel broke through with a devastatingly great profile on Katharine Hepburn, published in Esquire. Over the following two decades, Israel penned a trio of celebrity biographies, one of which, Kilgallen (a portrait of journalist and game show panelist Dorothy Kilgallen), was lauded as among the finest bios of the 1980s. By the 1990s, however, her past works proved long forgotten, as Israel found herself earning attention not for her biographies or countless magazine articles but rather her recent criminal activities. Director Marielle Heller’s Can You Ever Forgive Me?, based on Israel’s eponymous memoirs, opens on Israel (Melissa McCarthy) who, in 1991, is struggling to make ends meet, months behind on her rent and devastated that she cannot afford medical treatment for her beloved cat. Israel is desperate for an advance on her latest project, a biography of Fanny Brice, but her agent (the formidable Jane Curtin) cannot make that happen, nor does she terribly want to. The irksome, surly Israel has burned bridge after bridge in recent years and has no industry allies to speak of. At last, Israel finds a companion in Jack Hock (Richard E. Grant), a vivacious grifter who shares in her disdain for society and dependency on the bottle. Hock isn’t the least bit shaken when Israel presents her grand scheme to bring home that elusive dough - she is going to earn a living fabricating signed personal letters from deceased, high-profile writers, from Brice to Noel Coward to Dorothy Parker. Israel finds fleeting success but, when suspicions are raised around her documents, Hock steps in as a partner in crime to sell them on her behalf. With the FBI on their trail, however, is it inevitable that Judgment Day lurks on the horizon. 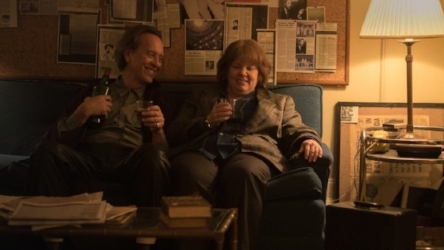 With a sparkling screenplay from Jeff Whitty and the reliably amazing Nicole Holofcener, and led by a pair of actors in career-best form, wholeheartedly committed to the material, Can You Ever Forgive Me? ultimately emerges one of the year’s very best pictures. McCarthy and Grant have a dazzling rapport, with each going to town on the comic and dramatic opportunities presented to them. Not to be overlooked is the rest of this splendid ensemble cast, including Curtin (who slays in her two scenes), Anna Deavere Smith (superb as exasperated ex) and particularly Dolly Wells, warm and perceptive as Anna, a book shop owner who takes a liking to Israel. A dinner between Anna and Israel proves one of the film’s most absorbing and affecting scenes, in a film full of them. Can You Ever Forgive Me? will be richly deserving of every accolade it inevitably earns for McCarthy and Grant - but I sure hope they aren’t the picture’s lone recognition this awards season. A sense of deja vu came over me throughout First Man, director Damien Chazelle’s latest collaboration with leading man Ryan Gosling. Two years ago, I was thoroughly enchanted by Gosling’s Oscar-nominated turn in Chazelle’s La La Land, a film which, despite my affection for its actors and overall look and feel, left me rather cold. An absorbing love story and Chazelle’s palpable affection for movie musicals aside, I never felt it quite got off the ground, nor, perhaps most egregious of all, did it sport a terribly memorable soundtrack. Fast-forward to the present awards season and, once again, I am head over heels for Gosling - for my money, First Man marks career-best work and should catapult him right toward the top in the race for Best Actor - and decidedly less enamored with the proceedings around him. This isn’t to say First Man is a bad picture but, after being spoiled in recent years by the dazzling likes of Gravity and Hidden Figures, it marks a surprisingly ho-hum endeavor. Gosling portrays Neil Armstrong, the legendary American astronaut who, as you may have heard, made history in 1969 as the first person to walk on the moon. First Man opens on Armstrong eight years prior to that awe-inspiring event as the test pilot finds himself on a streak of aerodynamic calamities. Colleagues are concerned he is distracted, which is indeed the case - he and wife Janet (Claire Foy) are devastated by the failing health of young daughter Karen, who ultimately succumbs to a brain tumor. Overwhelmed with grief, Armstrong dives further into work, applying for NASA’s Project Gemini. Accepted into the program, the Armstrongs join other astronaut families in moving out to Houston. With the Soviets making progress in their spacecraft efforts, Armstrong squarely focuses on his training and, in 1966, is named commander of the aborted Gemini 8 mission. Toward the close of the decade, Armstrong is again called upon to steer the ship, this time as commander of Apollo 11. The rest, of course, is history. First Man is at once refreshingly unsentimental and curiously uninspiring. Gosling’s restrained portrayal of Armstrong is brimming with melancholy and deeply affecting - he keeps the picture absorbing even while Josh Singer’s screenplay proves a colossal bore. Less successful is Foy, a usually marvelous actress who hits only familiar notes as Armstrong’s fretful wife. At least Foy has some modest meat to chew on, however - the rest of the cast is uniformly underused. From a technical perspective, First Man marks a grand achievement in sound mixing and editing, with Chazelle doing a fine, if often workmanlike job staging the mission sequences. What is ultimately, stunningly missing from the picture is any sense of awe, that intense feeling of wonderment that swept the world on July 20, 1969. First Man marks a triumph for its leading man but otherwise doesn’t much soar. Michael Myers, it’s so nice to have you back where you belong. You may be in your sexagenarian years, yet you continue to bash in brains and slice and dice horny teenagers with masterful precision. It’s just too bad the picture around you this time doesn’t operate at your same commanding level. I am a Halloween nut, through and through. Not only do I of course worship John Carpenter’s 1978 original - both among the finest pictures of its decade and greatest horror films of all-time - I’m even quite taken with Halloween II and Halloween: H20. Hell, throw Halloween 4: The Return of Michael Myers on television and I’ll cancel all of my prior commitments! So, you can imagine I was quite surprised and more than a little heartbroken as I found myself not so enamored with the latest entry in the franchise, David Gordon Green’s Halloween - a follow-up to the Carpenter original that opts to pretend all prior sequels never came to fruition. Perhaps most key of all is it erases that pesky development, which first arouse in Halloween II, that Michael and Jamie Lee Curtis’ Laurie Strode were siblings. This is something I was completely down for, yet Green’s Halloween doesn’t even satisfy at the same levels of Halloween II or H20. In the dismal Halloween: Resurrection, Michael found himself confronted by the craze over reality television. This time around, it’s true-crime podcasting, presented in the form of a pair of British journalists (Jefferson Hall and Rhian Rees) who, 40 years following Michael’s murderous rampage in the first Halloween, pay the psychopath a visit at Smith’s Grove Sanitarium. You see, Michael has been imprisoned there since his capture by Dr. Loomis (RIP Donald Pleasance). Now, with Dr. Loomis having passed on, he’s being treated by another eccentric doc, Ranbir Sartain (Haluk Bilginer). After egging Michael on, both showing him his former mask and bringing up Laurie, the podcasters pay a visit to none other than the sole survivor herself. Laurie has spent the past 40 years battling PTSD and preparing herself and her family for what she sees as Michael’s inevitable return. She’s been married and divorced twice and lost custody of her daughter Karen (Judy Greer), who now has a teenage daughter of her own, Allyson (Andi Matichak). Laurie, no surprise, hasn’t the faintest interest in cooperating with the Brits. She’s far more focused on her old foe, who conveniently is being transferred to a new facility on the eve of Halloween. It should come as scant surprise that Michael of course manages an escape, gets his hands on his old mask and greets Haddonfield with a long overdue, plenty grisly return. If Laurie is prepared, the rest of the community, per usual, is very much susceptible to Michael’s prey. Never before has this series been such a meandering slog as it is in its opening half hour. The insertion of true-crime podcasting into the franchise must have sounded timely and inspired on the page but it’s not the least bit compelling on the screen. Once Michael is back in action, the proceedings do at least muster the same satisfaction as a competent slasher picture, yet it’s never nearly on the same level as Carpenter’s original. As always, Curtis gives it her all as Laurie and especially provides the picture a boost in its final half hour, a cat-and-mouse duel between she and Michael that is claustrophobic in the best sense. Unfortunately, the supporting cast around her isn’t terribly memorable and there is at least one character and plot twist that, thankfully briefly, sends the film jumping the shark. Kudos to the very funny Jibrail Nantambu, portraying the only character (besides Laurie) you’re genuinely rooting for Michael not to knock off. Green does a fine job staging the rousing grand finale but the rest of his direction is strictly workmanlike stuff, decidedly not Carpenter-caliber. Speaking of Carpenter, however, his musical score, jazzed up a bit this time around, remains a stirring winner. If Halloween is hardly the worst entry in the series, it also falls tragically short of the greatness once so present in this franchise.